Although we were not expecting to be as far out of Blue Ridge as we were, we still loved the area, house and our time spent there. Everything from the beds to the couches were very comfortable. There is a great little store at the bottom of the hill that does breakfast and lunch. Breakfast was wonderful. It is around 20-30 minutes from Blue Ridge. Just plan your day around that travel time. We absolutely love the town and go every year for Thanksgiving. Our family enjoyed our stay in this wonderful cabin that had plenty of space and an excellent view of the mountains. Thank you. We Love it too! Came up for a late season stay. Very comfortable cabin with all of the amenities. Fantastic views. We are so happy you enjoyed your visit. We work hard at maintaining the property to make sure the views are great. Come back again and stay longer! This property is just beautiful! Amazing home with awesome views. Easy to access.We loved our stay here, and wished we had more time. Wonderful little town of Blue Rigde Ga.nearby.Perfect location. The home has everything you need and moore.Thank you for sharing your home with us- it is absolutely fabulous! Thank you. We love it too. So glad we can share this with our guests. Please come back again! 2nd visit as wonderful as the first! The Sundail is a beautiful, spacious, inviting property. Our vacation was our second trip, and included the same three couples, and we cannot wait to return next spring. Everything that I wrote in my last year review is still applicable: the privacy of having 3 bedrooms on three levels, the fun of cooking/grilling together, the comfort of the spacious common rooms and of the broad decks and spotless hot tub - perfect vacation for three reuniting couples! Elaine sent us email about fun things to do in the surrounding area, but WE WERE SO HAPPY AT THE SUNDIAL THAT WE ONLY VENTURED OUT ONCE, to the charming little burg of Blue Ridge (consider Harvest on Main for a gourmet lunch). i cannot praise this property enough. 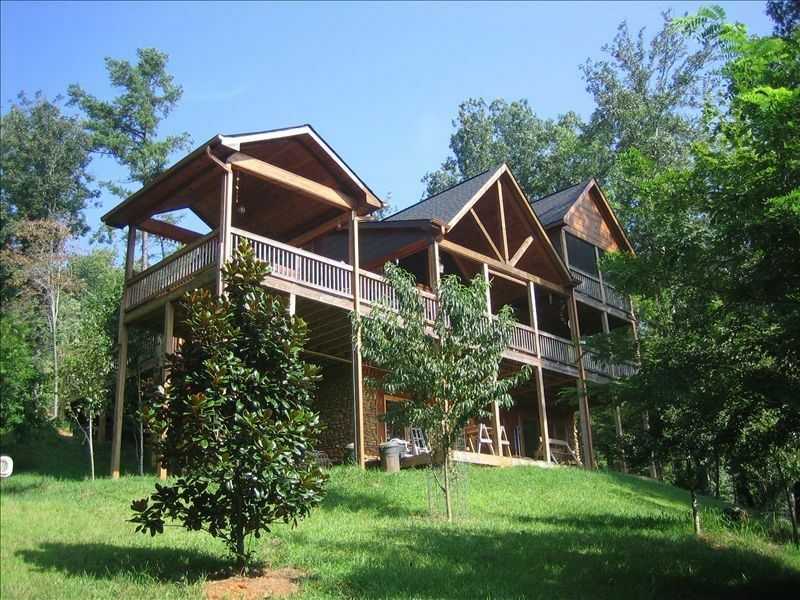 This was a great cabin to stay in while visiting Blue Ridge. Everyone loved the place and all the room. The kitchen was very stocked and we loved the roomy dining room off of the kitchen. Everyone had their own space and plenty of things to do. The view is beautiful! Great porch to sit on and take in the view. The kids loved the firepit and being in the outdoors, we saw deer two mornings in the yard. The only negatives I could think of would be: the hottub is not ready when you get there you have to turn the temp up and allow it to get hot, need new wash cloths, and a few more candles and flashlights (we were there during a storm and lost power, not a whole lot of options for light).